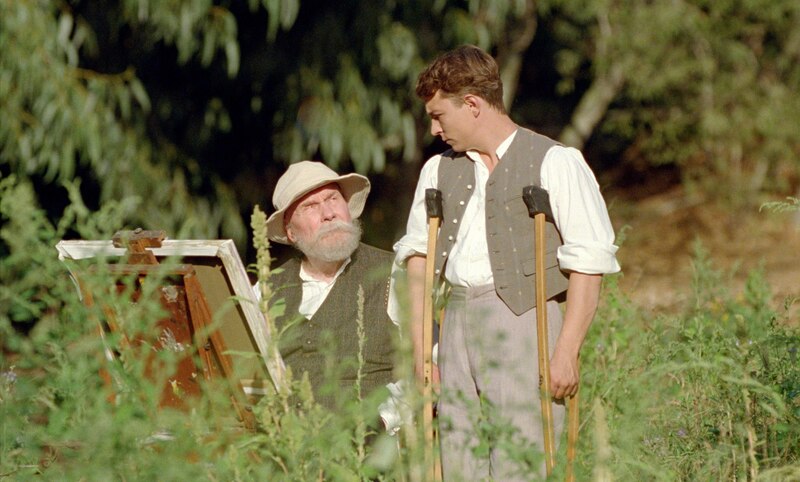 The name Renoir is highly revered in both the world of Art and in Cinema. Pierre-Auguste Renoir was one of the leading artists of the Impressionist movement. No less important in his field, Jean Renoir is arguably the greatest director in the history of French cinema. His Rules of the Game consistently sits a close second to Citizen Kane in critics lists of the best film ever made. His Grand Illusion was the first foreign film to be nominated for a Best Film Oscar and Sight and Sound voted him the 4th best director of all time. That these two men, so outstanding in their chosen artistic fields, should be father and son is so exceptional, it's a wonder they have never been the subject of a major film before. At last the omission is rectified with this adaptation of a biography written by Jacques Renoir, the great grandson of Pierre-Auguste. The story is set in 1915, as the career of the elderly and infirm Pierre-Auguste is winding down, and his son Jean (53 years his junior) is sent home from the war, injured and in search of a new career. It is not just artistic inclinations that the two men have in common, but an attraction to the same woman - Andree. She holds a unique place in history as being Pierre-Auguste Renoir's last model and Jean Renoir's first leading lady. She was in fact a driving force in getting Jean Renoir interested in cinema, at that stage an art form still in it's infancy. The film itself owes more to the painter than to the director. It's lush cinematography depicting the upper middle classes (and naked women) in sun-kissed French countryside gardens is the kind of tasteful, bucolic study that will delight lovers of Pierre-Auguste Renoir's paintings. Fans of Jean de Florette and Manon de Sources will be equally tickled. It all makes for very pleasant appearances, although the drama underneath only touches on such themes as familial jealousies, the struggle for artistic expression and of course, burgeoning love. It increasingly becomes more a story about Andree and her ambitions. Art and cinema historians should find plenty to admire in Renoir, and it's no wonder the handsome production is representing France at next year's Oscars. It is however, a film of quiet pleasures and those looking for an adrenaline rush would be best advised to look elsewhere. I love movies about artists so shall look out for it. There was an amazing moving at the MIFF about Camille Claudel which is worth looking out for as well.